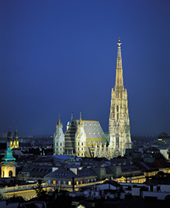 Vienna has an endless choice of historically interesting districts to visit and explore. We have the in-depth knowledge to bring the magic, tradition and hidden corners of this exceptional city to life in an original and entertaining manner. We pride ourself on having a flexible approach to clients’ requirements and we would love to advise and recommend guided tours in Vienna which can be tailor made to suit your individual interests. It might be your first time in Vienna or you could have lived here all your life. However well acquainted you are with the city, you’ll leave our tour having discovered some hidden corners you didn’t know existed.